It's been nearly a year since I got to meet the Baguio riders from the BBBGI race. Now that I'm back, I've hooked up with Aris, Jojit and Fermin at the Go Fast Bike Shop. It seems like old times again. In their tradition of welcoming a newcomer, they scheduled a ride that I could tag along with...the Yellow Trail. I'm not at liberty to say where it is 'coz it's more like a proprietary trail for them...besides, we just sneaked in. It took some pedaling to get to the Yellow Trail, which made for good warm up. Ever started a technical trail ride without a warm-up? Forget it. My body never got acclimatized to the bike and my timing was off...a dangerous thing if you've got ravines left and right of the track. I wouldn't do it again. Since I got back to the Philippines after having riden some sweet trails elsewhere, I'd been in search of mountain bike-specific trails here. Riders had to put up with fire trails, foot paths and plain dirt roads - nice, but not nearly good enough. That scenario is true for Mt. Maarat in San Mateo, in Montalban and in Sta. Rosa in Tagaytay. There would be an occasional short single-track and that was that. At the trail head, I got a glimpse of the track that lay ahead....whoa! The Yellow Trail was what I'd been hurting for... winding single-track that traverses on a mountain slope, complete with short brutal climbs, roots, ruts, drops and adrenaline downhill runs. This was the magical part of Baguio that was kept hidden to me from my last visit. With mountain cool weather, it was almost epiphany to be riding there. I was reminded of a Chuck Mangione song, "At Play in Fields of the Lord". We came to a portion frequented by downhill riders. It started at the summit with the trail steeply winding down and abruptly cuts off to perhaps a 6-foot drop. I few feet away was what seemed like a landing ramp. I thought they were kidding. We're talking LAUNCH here...we're talking major OUCH here. No. We didn't do it. I'm not that crazy anyway. It's too bad the riders we hoped to be doing the stunts that afternoon weren't there (paging Aki). We finished the ride by exiting through a ripped section in a chain-link fence. Ha-ha. If you still haven't figured out where this is, you're not from Baguio! We stopped by for some corner-store snacks. It was on them. I'm always touched anytime local hospitality is extended. I'm not used to it. We took our time, talking bike guts and more tales from the trails, after which we went back to Go Fast to hook up with the rest of the posse. No ride is complete without some carbo-loading, Bagiuio-style! Hands-down, this is the best bike trail I've done thus far in the Philippines...and I was told there's plenty more where it came from! I can understand why they might feel proprietary about this. This is the good stuff you only share to 'best friends' or at least to people who can share the same appreciation, respect and environmental responsibility with. After this ride, Baguio is never the same. 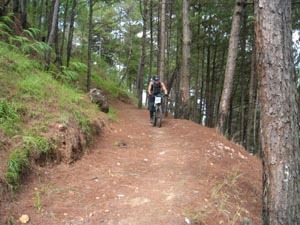 Baguio riders rock!!! (November 9, 2006) It�s good to know that someone like you appreciate the beauty of Yellow Trail. This is one trail where you can do horseback riding, running and mt. biking. Thanx uli sa posting mo sa amin...maganda ha!ha!ha! Pati baso-baso natin nailagay. Enjoy sa Sagada!